Why replace your ugly concrete when you can give it a face lift (and your money) at the same time? At Southeast Floor Prep we are licensed and insured Florida concrete restoration specialists. We provide concrete restoration services for commercial property owners in Miami, West Palm Beach Jacksonville, Tampa, Orlando, and beyond. Our unique concrete restoration process saves most concrete by rejuvenating or resurfacing it to look like new, and with diamond polishing or epoxy coatings your South Florida concrete floor so it will continue to look and feel like new. Concrete steps which are ugly, slick or badly pitched and hold water and thick ice. Driveways which are rough and just plain ugly, but otherwise are not falling apart. Slick concrete where you are afraid to even walk for fear of falling…is resurfaced and given a broom texture for slip resistance. Patios which are ugly, heaving and creating trip hazards can be evened out and given new life without tearing up your back yard with heavy equipment. We clean and seal exposed aggregate and we add grit to our clear seal so it becomes slip resistant. We can also resurface over exposed aggregate and make it like regular broom finished concrete. Our concrete restoration process is an eco-friendly and viable alternative to breakout and re-pour solutions. When you hire Southeast Floor Prep for concrete restoration services in the South Florida area, we will provide you with an honest evaluation of your concrete floors. Contractors certified in concrete restoration, crack repair, epoxy and urethane coatings. Expert customized solutions tailored to your budget and needs. 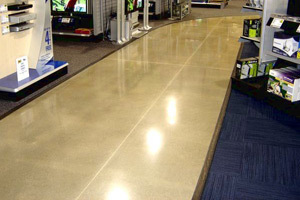 The installation of specialized coatings for industrial, commercial, and warehouse floors. If you are tired of looking at ugly, stained, pockmarked concrete, and desire it to look like new, please give us a call today so we can discuss your concrete restoration job. We are different from most concrete restoration companies you may have heard of in that we are dedicated to provide you with professionally resurfaced concrete that looks better than new without the need for completely replacing your concrete floors, patio or other concrete surfaces. When it comes to decorative concrete and concrete restoration services, you can count on us for reliable, time-tested results and the best quality around. If you are looking for a Concrete Floor Restoration Company in South Florida then please call toll free at 1-877-GRINDFLOOR (1-877-474-6335) or locally at 561-748-7754 or complete our online request form.